Gary Carlough founded EDGE studio in 1995 envisioning a multi-disciplinary firm that brings together individuals from varied backgrounds to challenge the conventional understanding of design. 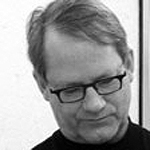 With over thirty years of experience in project management and architectural deign, Gary is committed to designing spaces which enrich the experience of the other inhabitants, and to understanding the programmatic, cultural, physical and economic contexts which define the development of these spaces in order to make them reality. His experience includes a broad array of projects from complex systems design for technology and research facilities, adaptive re-use of historic buildings, LEED and sustainable design and interior architecture to highly sophisticated programming analysis. Gary is active in the community serving on the Deign Committee for the Pittsburgh Cultural Trust and working with the Penn Avenue Arts Initiative and the Friendship Development Association. He as held as well as participated in numerous community charrettes, town hall meetings and public forums and has contributed time to serve on national design and award juries. Gary has a Bachelor of Architecture from the University of Arizona and studies at the Architectural Association in London. He as served as an adjunct full professor at Carnegie Mellon University’s School of Architecture.